Ice Cream Man - . Mr. Rosenberg was never really a ballplayer. He had a year or two of little league around first or second grade. 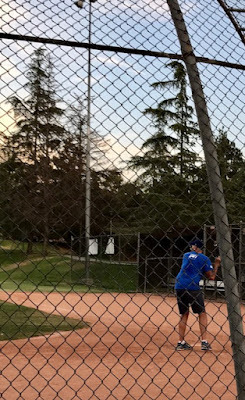 He played tennis in high school and has run a number of triathlons over the years but baseball wasn't his thing. In his first at bat of our little game, he hit a ground ball past second, and as he took off running, he slipped on home plate and went down hard on his knee. He got up and made it to first, bleeding. On his second at bat, he hit a home run over the fence driving in two runs. In Bob's league, it's a tradition that when a player is up to bat with bases loaded, all of the players yell "Ice Cream Man!" If the player hits a grand slam, then the parents have to buy ice cream for the whole team after the game. On his third at bat, Mr. Rosenberg hit a grand slam, tying up the game. It was a very warm night. We were playing quickly to end our last inning before we ran out of daylight. The moon was almost full in the sky and everyone was laughing and cheering each other on. The mom sitting next to me leaned over and said, "It's kind of perfect right now, isn't it?" The kids ended up winning the game 11 to 10. I commented to Bob, "You and Dad were both big hitters tonight." "It must be in our blood, Mom," he said. After the game, we all walked down the block and Mr. Rosenberg bought everyone ice cream. What a great memory this will be. I hope Mr. Rosenberg's knee is alright. He's recovering nicely. Ice cream helps everything.